Giving a damning report on Sri Lanka’s failure to take adequate action against human rights violations during the conflict and amend the Prevention of Terrorism Act (PTA), United Nations Special Rapporteur on Human Rights and Countering Terrorism Ben Emmerson yesterday warned that the international community is running out of patience and called on the Government to fast-track its reconciliation measures. “There will be a point that the international community reaches the end of its patience, and then a range of consequences could befall Sri Lanka,” Emmerson said at a media briefing to mark the end of his visit to Sri Lanka. Emmerson spoke to the media at the end of a four-day visit here during which he met with Prime Minister Ranil Wickremesinghe, Ministers, heads of the armed forces, the Attorney General as well as those detained under the Prevention of Terrorism Act (PTA). “Such as potentially increasing the various measures by the Human Rights Council or indeed a reference to the Security Council, there is a range of measures increasing in severity that are potentially available for the international community,” he said. 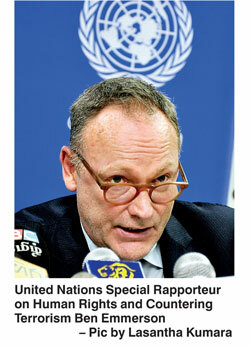 Emmerson also stressed that the country is being held accountable for commitments made by Sri Lanka. He went as far as calling individuals who seek to characterise them as demands imposed by international community and the UN as “silly, misguided” and said that they lacked in the information that is necessary to evaluate the situation. “These are not commitments imposed externally, but commitments Sri Lanka undertook,” he stressed. Stating that torture is “endemic and routine for those in custody”, Emmerson was severely critical of the Government’s lack of progress in repealing the current PTA. The number of features in the proposed legislation to be adopted in place of the PTA also came under severe criticism, including the provision making confessions extracted by a police officer while in custody admissible in court. Emmerson also pointed out that the proposed law lacked provisions to deal with modern terrorism trends such as the prevalence of Foreign Terrorist Fighters in this part of the world. However, Emmerson commended the undertaking by the Government to engage in a process of constructive dialogue with the team in Geneva in an effort to improve the draft legislation before it is placed before Parliament. “There is still time to get this legislation right, and for it to become the cornerstone of a new order in Sri Lanka,” he said. Stressing on the need to support the Government, Emmerson urged different sections in the ruling coalition to unite to achieve goals set in the UN Human Resolution co-sponsored by Sri Lanka. “We need now to be uniting behind the Government, all those within the Government who are committed to delivering peace,” he said.